There’s a funny thing about the wedding industry that I’ve been reflecting on for quite some time. Here’s what got me thinking. We all take an immense amount of pride in what we do – we live, eat and breathe our work. We explain to our clients how important our job is and how no one can do it the way we do it. We write blog post after blog post about the importance of hiring professionals for such a unique and non-repeatable day yet we don’t practice what we preach. Just as I’m sure there’s a “cousin with a good camera” documenting someone’s wedding for $200 bucks or a bride making her own bouquet from random supermarket flowers, there’s also an awful lot of wedding vendors who have made up their own contracts. So… when did we all become lawyers? What makes us think that we can just copy and paste clauses from various contracts that people have shared online? How do we know those came from credible sources? How do we know that the information contained within these “contracts” is correct for the current year? Or for the correct country or province? How do we know that there haven’t been changes in recent laws that make some of these clauses invalid? We need to run our businesses with the same values with which we market ourselves to our clients. If we tell clients that our job is important and that having a professional is important then we need to stop being our own “lawyers” and start developing a relationship with a local small business lawyer and not only get our contracts reviewed but have a source of reliable information for when conflicts arise and we need up to date and accurate legal advice. Who owns the copyright to an image? Can a photographer or videographer say that they own a certain “pose” and ask the other not to shoot a certain pose? Can a vendor use a photographers image on social media without asking them? Does it matter whether they credit them or not? Do non-image makers need a commercial usage agreement in place when using images from a photographer? If so, why? Is there a difference between sharing images on social media vs. on a blog or static portofolio? What about in print advertisement? Copyright vs. model releases – what’s the difference? How long do you legally have to keep digital files? Do you have to keep all the files or just the ones you culled? How long does a client have to tell you that they don’t like their photos? Can they come back in 4 years and demand re-edits? What are the legal steps you have to take if someone uses your photos for advertising without your permission? Can a primary photographer/videographer really tell the second shooter that they don’t have the right to use the images? How do copyright laws work if your client doesn’t live in Canada? Or if you’re shooting a wedding in a different country? What needs to be in your contract if you’re offering destination services? Is it true that using the word “deposit” is bad? How do you know what kind of unique clauses to put in a contract? How often do you need to update a contract? Is it wise to negotiate parts of your contract and if so, should you be getting a lawyers opinions or help with this? Can you legally charge late fees? If so, is there a maximum? Can any vendor use a photographers image on social media without asking them? Does it matter whether they credit them or not? Can you charge someone a premium for using a credit card or give a discount for using non credit cards? Can you or should you put an expiry date on gift certificates? Are non-compete agreements a viable or useful tool? Is it okay to ask for a non-refundable retainer on tangible goods? How do substitutions of tangible goods or services work? What proper steps do you need to take if you want to fire a client? Can you say that you for-sure know the answer to these questions? Or do you think you know the answer but have a seed of doubt? Do you think you’d be more confident in yourself as a business person if you could hear the answers to these questions come straight from a lawyer? Speaking of my own experience, I became infinitely more confident after developing a relationship with my lawyer and I know my friend Christian from One Heart Films feels the same way too. 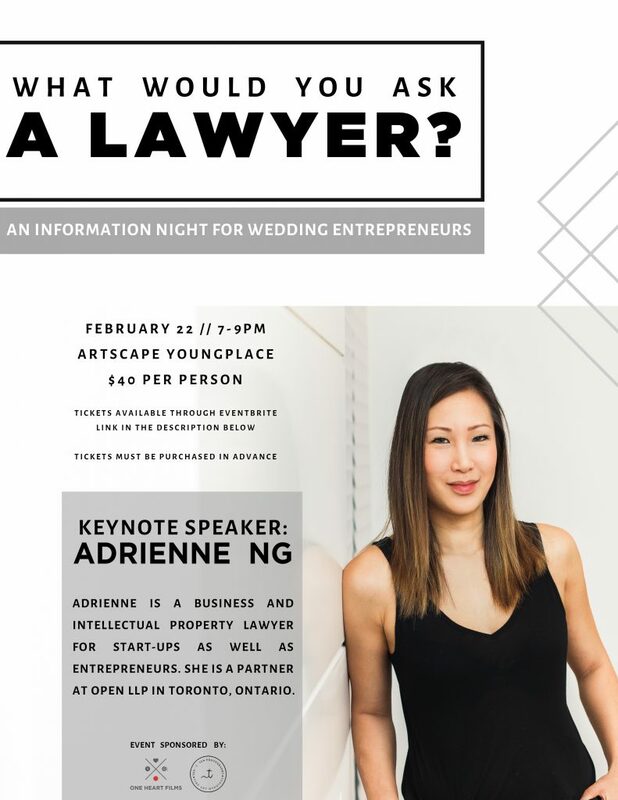 After chatting with Christian about the need for more accessible information about topics like the ones above, Christian and I put together an event with our friend Adrienne Ng who is a small business and intellectual property lawyer. We’ve created an information night that is welcome to all wedding professionals and during the evening, Adrienne will be answering these questions as well as opening up the floor for a Q&A to address additional questions. Real information from a real expert. Can’t wait to see you all there so we can learn and become better together!